E-Bike: Godzilla, I am Brian Nordwall, the owner of Seattle E-Bike. Welcome. I’m sorry you couldn’t fit into our studios, but the Seahawks were gracious enough to lend us their gridiron for this interview. G: Thank you for having me Brian. I rarely get this kind of thoughtful media attention. Also, I have often fantasized about playing in the NFL. Fullback or tight end. E-Bike: Godzilla, may I ask a personal question? Your toenails are awesome. Where do you get your pedicures done? G: Brian, thanks for asking. I use Rayotek Grinding in San Diego. They have a huge, five-axis grinding machine with diamond tips that my nails really love. E-Bike: Godzilla, Seattle folks are wondering what is going to happen when Carmageddon is over. Will our traffic nightmare end? G: I wish I could say yes Brian. But the capacity of the new SR-99 through the core will actually be less. Considerably less. And, there will be no on ramps or off ramps serving the downtown anymore. You think I’m a nightmare, wait until you see First, Second, and Fourth Avenues. E-Bike: I have heard they are even thinking of starting to charge a toll. G: Brian, I’m afraid that goose is completely cooked. $2.25 during rush hour. It is not a problem for me Brian. I ignore the tolls. But I’m 350 feet tall. I never get tickets. E-Bike: Godzilla, what brought you to Seattle? G: Brian, since I came into being in Japan in 1954, I have made it my "mission d'être", as we large lizards like to say, to raise public consciousness about the traffic issues in large urban areas. E-Bike: What are you proudest of? G: The Tokyo Subway system. I inspired it. E-Bike: What are your thoughts about Seattle? G: I fear your planners are not getting it right. I will probably be back. E-Bike: Is there any hope? G: Actually, yes. People like to go where they like to go rather than where mass transit directs them. Here, your 50 Billion Dollar transit system does not serve many neighborhoods. Where traffic is at a near standstill, your E-Bikes provide autonomy and the ability to move much faster than the flow of traffic. I give them to all my smaller lizard friends. E-Bike: Why E-Bikes and not regular bikes? G: Brian, have you ever looked at T-Rex's legs? Super short. No Tour de France for him. Second, we are all at least 75 million years old. My little brothers need to stay in shape, and E-Bikes help them do it. That is even more important for you humans. Also, I come from the Cretaceous period with heavy CO2 emissions from volcanoes. It was really, really hot. Great for lizards like me but not for you mammals. E-Bikes are emission free. I like to be environmentally responsible. G: Do you ride one? G: No. Even your mighty electric fat bikes are too small for me. I am rather large. E-Bike: Why is exercising using E-Bikes so important? 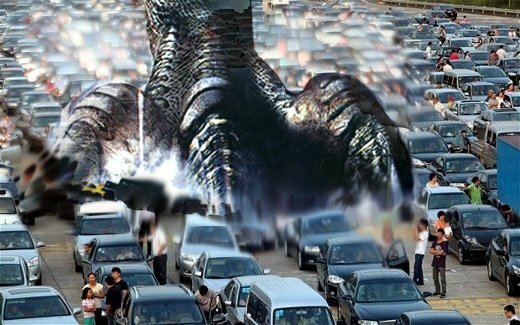 Godzilla: Pedal. Pedal like hell. G: A distant cousin. His name is Walter.